Breckenridge Mayor Eric Mamula responds to citizens' questions during the annual State of the Town address at Town Hall in May. An exchange at Tuesday’s meeting of Breckenridge Town Council hinted the strained working relationship between the town’s elected officials and Vail Resorts could soon improve, as the mayor and a resort representative both expressed interest in working together again on public issues. Breckenridge’s town government and the county’s largest private employer have been locked in a tumultuous public relationship since butting heads over the construction of a large-scale parking garage at F-lot in 2016. There have been letters to the editor, public statements and a general belief among the council that officials with Vail Resorts, which owns Breckenridge Ski Resort, are unwilling to work with the town on issues unrelated to public parking. The spat arose after Breckenridge voters passed a tax on lift tickets in November 2015. At the time, resort officials believed they had “a promise” that money generated by the new tax would pay for a new parking structure at F-lot with 500 to 700 new parking spaces. “Between last summer and up until now, I and my team have prioritized rebuilding our relationships,” wrote John Buhler, vice president and chief operating officer of Breckenridge Ski Resort, in a guest column published in June 2016 after the town shifted course and decided not to build the F-lot parking garage. Early in his column, Buhler claimed Vail Resorts was rebuilding relationships, but the piece did little to mend fences. From the council’s perspective, most of the people currently serving, including Mayor Eric Mamual, were ushered in after the lift-ticket tax was put on the ballot and the promise to build at F-lot would have been made. Additionally, there was never anything binding in the ballot initiative nor any official actions taken by council that would mandate the new council follow through on the previous council’s plans. For the members of council, they were simply doing their due diligence to select the best location for a new parking garage. Mamula himself addressed the issue through a citizen’s question posed at the State of the Town Address in May. In answering the question about the town’s relationship with Vail Resorts, Mamula was complimentary of the company in many ways but didn’t back down, either. Ultimately, the council decided to pursue a new parking structure at the nearby Tiger Dredge parking lot, which will have some overlap into F-lot but won’t add the number of additional parking spaces Vail Resorts was hoping to get in the downtown core. 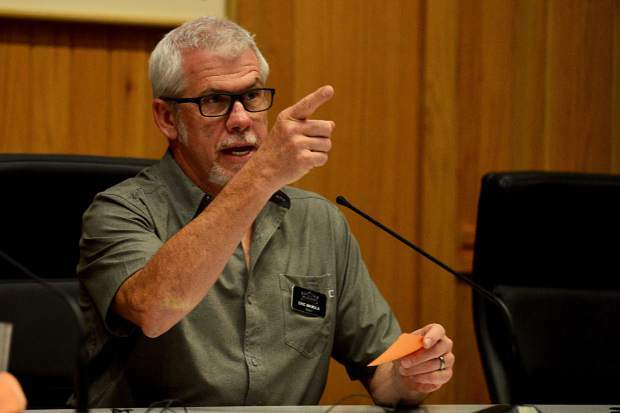 Filling in for Buhler at Tuesday’s council meeting, Kevin Burns, Vail Resorts’ senior manager of mountain community affairs, gave council the regular ski resort update. He started off by plugging Breckenridge Ski Resort’s season opening, just over a month away, and said the Falcon SuperChair lift should be up and running in December. Burns also highlighted a recent series of environmental projects completed by 288 volunteers from within the company, doing things like building new trails. Burns’ update came shortly after members of a local campaign who’ve been seeking a commitment from the town to have all buildings, public and private, completely powered by renewable electricity had their turn. With a similar move afoot at Vail Resorts, Burns applauded the local group and said the company will be releasing its own renewable-energy roadmap later this fall. That was all Mamula needed to reiterate something he and other council members have been repeating for months — that they’d like to work with Vail Resorts on issues in the public sphere. “Let’s talk environment for a little while,” Burns responded.